Life In A House of Blue ! : Dapple - Green. Clean. Baby-Safe. Home > baby, Eco-Friendly, Home, Review > Dapple - Green. Clean. Baby-Safe. Dapple - Green. Clean. Baby-Safe. "Dapple is a line of natural-based cleaning products for households with children. Dapple products are baby-safe and baby-specific - using ingredients found in nature that are also proven to tackle unique baby cleaning challenges, from dried milk on bottles to sticky fingerprints on toys." Do you wash your babies bottle, cups, dishes or even toys and they just do not seem clean or still have a smell or even a film left on them ? 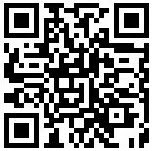 If so you need to to try dapple ! Dapple was created with input from leading pediatricians and a team of chemists with expertise in green cleaning technology, each one of their products are specially formulated to solve a different baby-related cleaning problem, with natural-based ingredients that are baby-friendly and designed to address the specific issue at hand. I had the opportunity to try Dapple Dishwasher Powder, Travel Size Dish Liquid and the Toy Cleaner Travel Wipes. When I used the dishwasher powder I was not sure if something so natural would clean a load of dishes and to my surprise it did ! The dishes came out clean with no residue. I used the dish liquid to was my sons milk sippy cups and they washed up clean and no odor that I find milk seams to leave and stay with other soaps. The toy wipes are great, I keep the travel size in my diaper bag and I put them to good use when I took my son to the Dr. last week and wiped off the toys he wanted to play with. 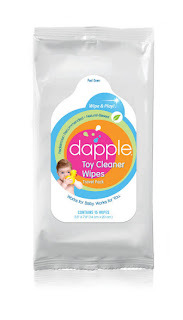 Dapple Toy Cleaner Travel Wipes - Use it for cleaning everything that little hands touch – from toys to high chairs, swings and more. Dapple Toy Cleaner Wipes feature green technology and harness the power of natural ingredients such as baking soda to keep your surroundings and environment a healthy clean. Dapple Dishwasher Powder – available in cases of 6 (32 oz. boxes). Features specific enzymes to target the lipids and proteins commonly found in baby foods. 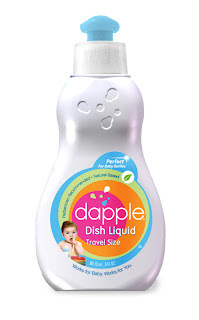 Dapple Dish Liquid (Travel Size) – Great for diaper bags, plane trips and vacations. Features award-winning green technology to target milk residue and baking soda to combat odor. 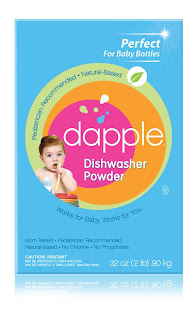 Dapple's full line of baby safe household cleaning products is now available at more than 200 Babies R Us stores, Toys R Us, Diapers.com , Giggle.com and Dapplebaby.com as well as many boutiques across the US. Meet the Moms behind Dapple and more about their products ! Great post. We could use the Toy cleaning wipes for our daycare to keep everything germ free. LOL. I have heard such great things about this product. I will definately have to try it out. This is the first I've heard of Dapple! It sounds great!